100 Years ago on November 6, 1915 my grandfather, Tom Lister, enlisted in Victoria, British Columbia. 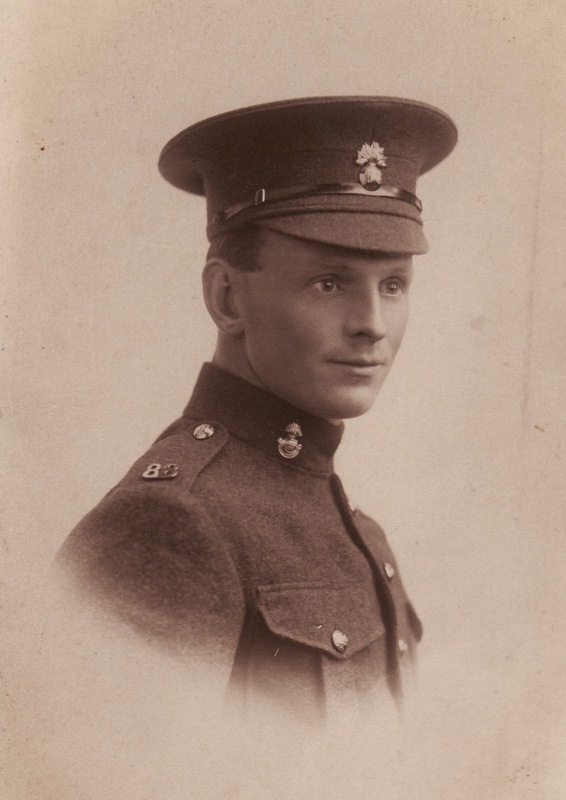 He joined the Victoria Fusiliers 88th Battalion. He had been living in Duncan and working as a farmer. He had immigrated from Skipton, England in 1910. The Daily Colonist from May 28, 1916 declared that "the Victoria Fusiliers hold the record for the number of Cowichan recruits." 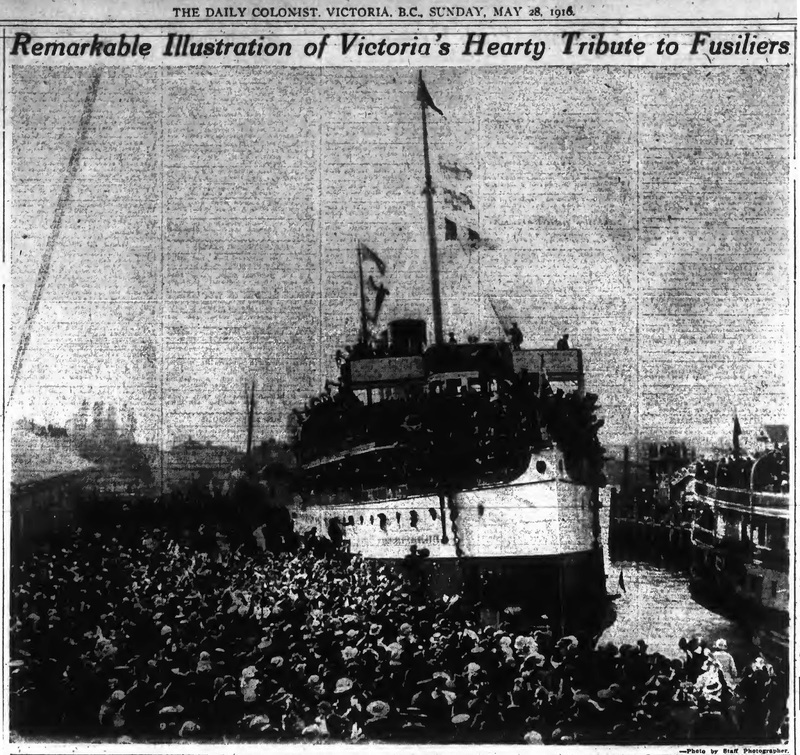 The same issue has a wonderful image of the crowds in Victoria bidding farewell to the troops on board the C.P.R. S.S. Princess Charlotte. Lieutenant Colonel Harold Joseph Rous Cullin, commanding officer of the 88th Battalion, wrote a letter to the Daily Colonist outlining their trip across Canada by train from Vancouver to Halifax. The bright and cheerful tone of the letter is punctuated with snippets of their training and welcoming receptions at the various stops. Marches in Medicine Hat, Alberta. Push-ups and knee bends in Schrieber, Ontario. Cigarettes and oranges in Kenora, Ontario. In Ottawa, Ontario they participate in a parade and a march to Parliament Hill where they are inspected by the Duke of Connaught and meet various colonels, generals, and government ministers. They saw the scaffolding on the Parliament Buildings; a fire destroyed the original Centre Block in February of 1916. Then they mark back to train to head to Montreal. "Arrived in Halifax on Wednesday, May 29, at 11 a.m. Ten troop trains ahead of the 88th, two behind. Nearly 7,000 troops aboard. Heavy rain. Authorities very strict and guards everywhere. Lots of warships and destroyers in harbor. Men all intact. Wonderful behavior. No sickness in 88th. No deserters. No defaulters. Spirits simply wonderful. Message from Victoria Fusiliers to Victoria: ' Keep on recruiting. The war is only just starting. It will go another two years. Fill up the 88th again.'" On May 31, 1916 they sailed from Halifax and headed to England. "Soldiers of the First World War (1914-1918)." Record Group 150, Accession 1992-93/166, Box 4930 - 35. Library and Archives Canada, Ottawa. “Vancouver Island.” Daily Colonist, May 28, 1916, 17. “Remarkable Illustration of Victoria's Hearty Tribute to Fusiliers.” Daily Colonist, May 28, 1916, 19. Cullin, Lieut-Col. “Had Fine Journey Across Continent.” Daily Colonist, June 29, 1916, 5.